On the 10th October, fifteen Richmond Acrobats flew to Poland to compete at the European Age Group and European Championships as part of the GB Team. The first week was the Age Group Championships competition and RGA had 3 gymnasts competing. The 12 other gymnasts had to train and wait for their competition to start the following week. Age group gymnasts: Tabbie Dawson, Ruby Riekstins and Sofia Bennett were competing in the very difficult category of 12-18 women’s groups. Tabbie is an experienced competitor at International level with a number of International credits to her name, but her partners were not so experienced- Sofia has only been a member of RGA for 10 months! They performed beautifully, wowing the audience with their intricately choreographed routines and high-level skills. Unfortunately, due to the one per country rule they did not qualify for finals, but have had a fantastic experience which should support them going forwards. 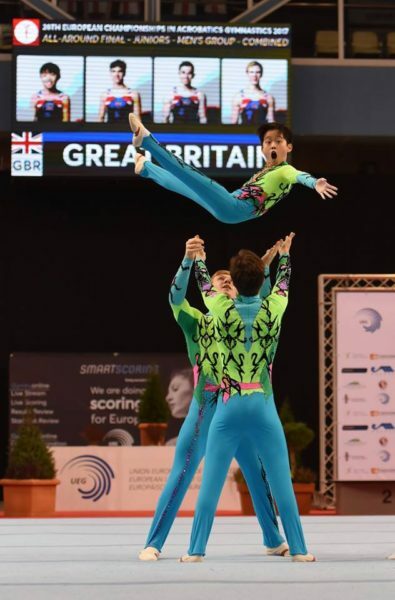 Head of RGA Acro and European Gymnastics Committee member, Melanie Sanders, said “the trio performed amazingly and have made their club extremely proud”. After the Age group competition was finished the Junior (13-19 competitors) and Senior (15+ years) Championships started. The 12 competitors left to compete for RGA had already had a week to acclimatise, and were all raring to go after cheering on their team-mates. The Junior women’s group of Millie Jeffcock, Scarlett Wright and Kira Dunn had a difficult build up to the competition with an injury needing 6 weeks out of training to contend with. But the National Coach was certain they would do well, so they were given a “wild card” to compete for GB without trial based on the success they’d had Internationally throughout the year. 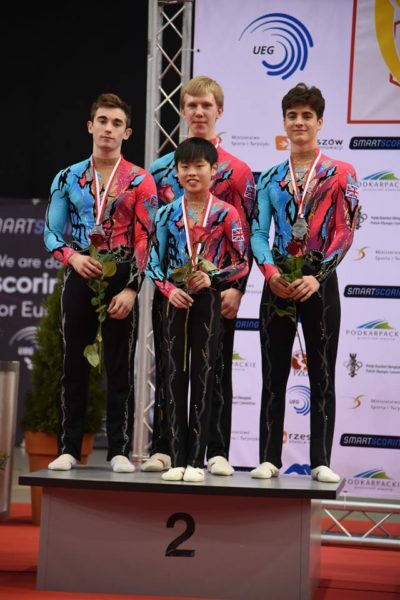 They did fantastically well performing some gravity defying strength moves and were only kept out of the finals by the same one per country rule that had befallen the 12-18 trio. Scott Patterson, RGA & GB Coach at the Championships said, “they worked so hard to achieve all they did, with some clean and stylish routines and everyone is so proud of what they have achieved in such a short timeframe”. The Junior Men’s Group of Alex Papworth, Alex Balfe, Bertie Cardillo-Zallo and Aidan Lim are used to wowing the crowd with their quirky routines and height in their somersaults and they didn’t disappoint- only the Russian competitors could better them and they came away with 3 well-earned silver medals: – silver balance medal, silver dynamic medal and silver overall medal. The crowd went wild for their combined routine set to the music from “Footloose”. Personal coach Scott Patterson said “the boys have really done well this year- going up an age category and fighting through a few tough spots due to injuries. But they did fantastically well in the end and are great role models for the younger male gymnasts we have at RGA”. The Senior Mixed pair of Lewis Walker and Kitty Williams were bronze medallists from the World Games in Poland in July and had already shown the rest of the World what they could do. This was their chance to either match that medal or go one further. 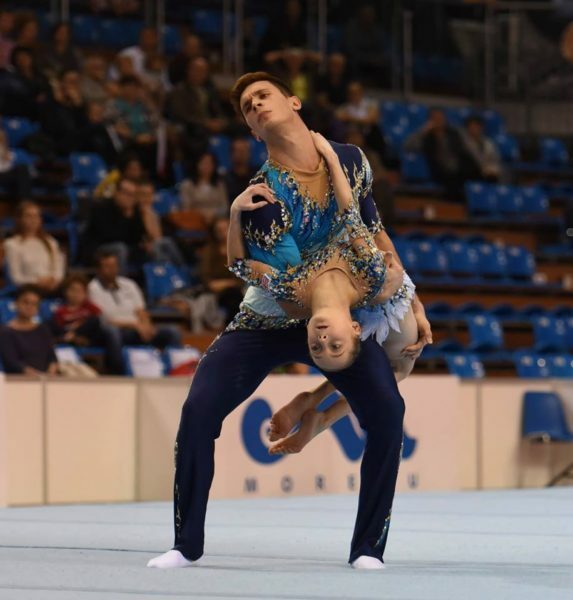 Their most difficult competitors were the Russian mixed pair who have a World, a European, a European Games and a World Games gold medal to their name. This competition was not going to be easy. 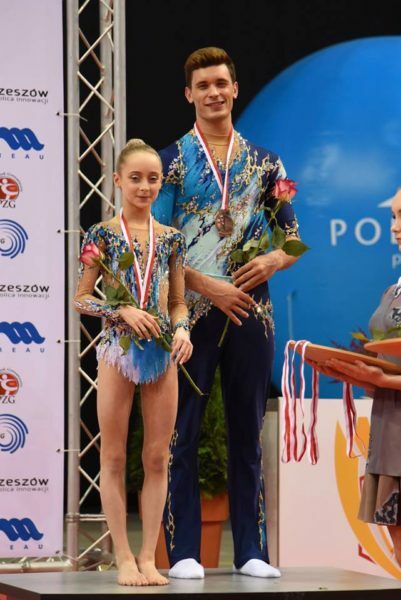 After a wobbly start, Lewis and Kitty showed everyone what wonderful competitors they are- with beautifully choreographed and performed routines, complicated, high difficulty moves, they won 3 well-deserved medals: – Silver dynamic medal, bronze balance medal, bronze overall medal. Personal coach Melanie Sanders said “I am so proud of how well this pair performed, they should be so proud of what they have achieved for RGA and Great Britain in a very short timeframe and have a lot more still to show. They truly deserve the “special award” given to them by British Gymnastics this year after everything they have achieved. The Senior women’s group of Jen Bailey, Roxy Parker and Gabby Potter started their competition with a bang! qualifying in first place with their dynamic routine. Seasoned competitors, these 3 gymnasts combine strength and power with flexibility and dynamism. Although not making the all-around final due to the one-competitor per country rule, they went into the Final of dynamic with high hopes, only pipped at the post by the Russian trio earning our girls a Silver dynamic medal, which was a fantastic result. Personal coach Melanie Sanders said “Senior level gymnasts have to work the hardest of everyone- the moves are so technically difficult, and the smallest thing could stop them from achieving the skill. These girls had to forego their summer holidays to train through for 24 hours a week every week to ensure there wasn’t a decrease in skill level ready for this Championships. Their dedication to the sport and to each other as a team is commendable. We are all so very proud of their very hard fought silver medal- a fantastic result. What a fantastic way to end the year! Salme Naylor, Director of RGA said “the hard-work and dedication that all these gymnasts and their coaches have put in is commendable. They are really a credit to the gym and their families. This is the standard of achievement that young people, with the right structure around them including dedicated coaches and supportive families can achieve. They really are fantastic young people and a role-model for everyone they come in contact with. Many of them also coach at RGA- giving back to the younger gymnasts and supporting them on their gymnastics journey. Some of them will now retire from competitive gymnastics to concentrate on their studies ready for going to University and we wish them all the very best for their future. We are very certain they will continue to achieve in whatever they decide to do.